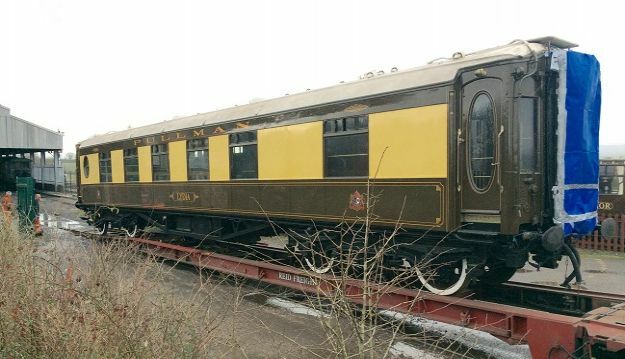 Pullman Car Lydia arrived on the West Somerset Railway on 28th February 2017. Lydia is privately owned and has come to the West Somerset Railway for recommissioning work to be carried out at West Somerset Restoration Ltd at Williton. Lydia is an exceptionally historic British Pullman Car. Built in Birmingham in 1925 she was then shipped to the continent and ran for three years between Milan and Nice. During the 1930’s she was often used in the Imperial Airways service from Waterloo to Southampton to connect with the flying boat service to a range of Empire destinations. During World War 2 she served in General Eisenhower’s special train, code-named ‘Bayonet’ as he toured southern England planning the D-Day landings. In 1965 she was used in Winston Churchill’s funeral train. In 1968 she toured the USA with famous loco ‘Flying Scotsman’ which will be visiting the West Somerset Railway in 2017. Lydia was brought back to the UK in 2001. Discussions are underway to examine whether Lydia can be brought into traffic on the West Somerset Railway.